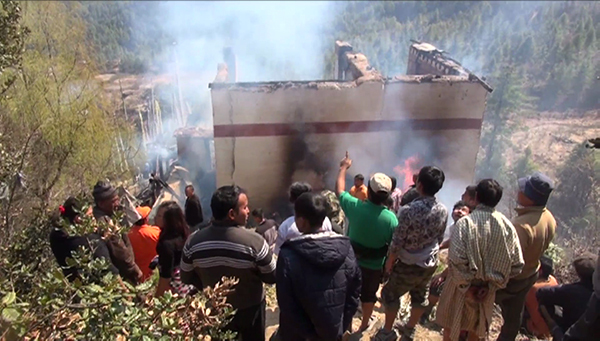 Dago Goenpa in Lango, Paro was razed to the ground by a fire today. 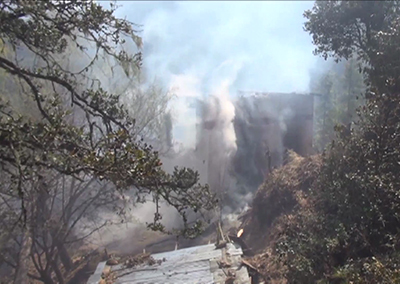 The privately owned lhakhang caught fire around 10:30 am. There is no road to the Goenpa, which made firefighting impossible. Firefighters watched helplessly as the Goenpa went down in flames. The fire was contained only after the helicopter dispatched by the Royal Bhutan Helicopter Services Limited dropped gallons of water over it. Eye witnesses say the fire started from the Goenpa’s power miniature circuit breaker or MCB. However, the owner of Goenpa, Karma Choden, is blaming the people who have been staying at the Goenpa on retreat. “I come here every day to make offerings. I came this morning and checked everything before leaving. There is no way the fire could have been started by electric short circuit. They should take responsibility for the fire,” said Karma Choden. Karma Choden added that as soon as she saw smoke, she called them but they did not answer. By the time her husband and the Tshogpa rushed to the Goenpa, the fire has already engulfed Goenpa and nothing could be salvaged.